This is the extended model of a single acting cylinder with mass, friction and end stops. The travel of the piston is restricted. At the cylinder heads two collision models prevent the piston from traveling any further. The friction between the piston and the cylinder walls is modeled by static and viscous friction. 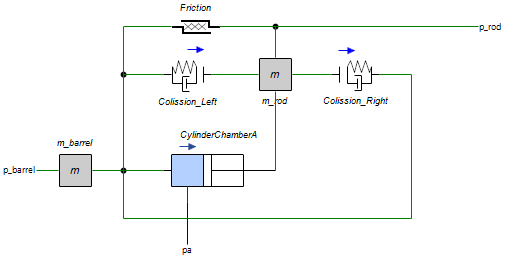 When a the cylinder piston collides with the cylinder heads, simulation may get very slow or even become unstable. In these cases you are advised to use the BDF-method with default settings. Try to change the absolute integration error until a stable simulation is obtained!